Pediatric surgery is demanding. A surgical error can be deemed medical malpractice if the surgeon’s performance falls below the accepted standard of care for a reasonably competent surgeon under similar circumstances, and the patient is injured as a result. Rarely are surgical errors caused by a physician’s actual incompetence. Most errors are due to poor planning before surgery or failing to properly communicate with the child’s parents or guardian about the possible risks associated with a procedure. Ineffective maintenance of air, heat, or water supplies leading to infection. Surgical Errors Law is a subset of Medical Malpractice dealing with injuries that occur during surgical procedures. It mainly focuses on surgeons failing to give adequate information to the patient or the patient’s family to allow for informed consent, performing unnecessary procedures due to negligence or pecuniary interests, performing procedures for which the surgeon is not qualified, performing a procedure on the wrong patient or wrong body part, or other mistakes made during surgery. There is not much room for error in an operating room, but healthcare professionals are human and they can make mistakes. Sadly, more than one-third of patients who have suffered surgical mistakes are permanently injured. According to one study, all doctors have made mistakes, but they often don’t tell their patients – or parents. JAMA Pediatrics (April 2016) found that parents frequently reported errors and preventable AEs, many of which were not otherwise documented in the medical record. Child medical malpractice attorney Jeffrey Killino has extensive expertise and experience with all types of child malpractice cases, including those arising out of injuries and deaths that occurred in hospital. If your child has been injured or killed and you suspect that your child’s injury or death was due to hospital negligence or error, attorney Killino can help you obtain justice from the responsible parties. A U.S. hospital suspended its pediatric cardiac surgery program after two babies recently suffered serious complications following errors made during open-heart surgery. Needles were left in two children after heart surgery. One baby was rushed back to All Children’s after her mother was told the news, but the surgeon who performed the operation said it didn’t exist. Ten days later and unrelated to the needle, the baby had emergency surgery at another hospital. That surgeon found a needle stuck in the baby’s aorta. A 4-month-old developed a serious chest infection from her surgical incision. Her parents said the hospital room was not sterile. A 5-year-old had a heart transplant at All Children’s in March 2017. Soon after, the stitching connecting the new heart to his body broke, and he had a massive stroke. Today, he can no longer walk, speak or feed himself. Johns Hopkins All Children’s said in October 216 that it had slowed surgeries. It later halted all pediatric heart surgeries and is conducting a review of the program. On a positive note, healthcare professionals over the last few decades have gotten better at acknowledging mistakes and apologizing to patients when a mistake happens. But sometimes more than an apology is needed. Childhood illnesses and injuries are devastating. They can overwhelm you. 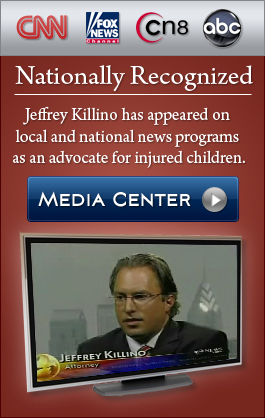 While there is no amount of money can make up for the pain that your child and family have suffered, Jeffrey Killino has a well-earned reputation for child malpractice cases and he will fight for your rights. 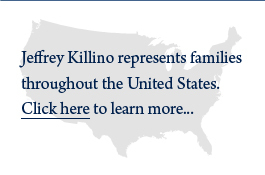 The Killino law firm is dedicated to making sure that you receive justice and get the compensation you deserve.